Achtung! Cthulhu Tactics - turn-based strategy meets Lovecraftian fantasy and WW2 in this adaption of the wildly successful tabletop RPG. Achtung! 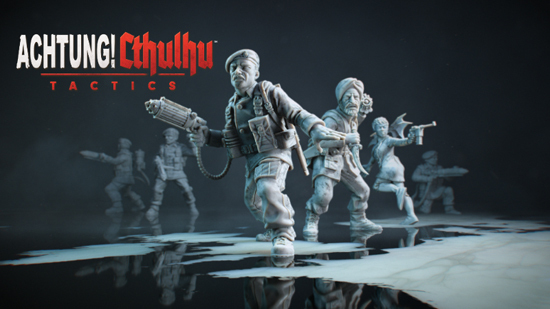 Cthulhu Tactics is based on the hugely popular tabletop RPG from Modiphius Entertainment. The game is set in an alternate history of World War II where the Nazis’ investigations into the occult have resulted in the summoning of Lovecraftian monsters. With supernatural beings by their side, the Nazis might just destroy the allied forces and irrevocably alter the course of history. To stop this from happening, players take control of Charlie Company, an elite band of allied forces sent in to do the impossible; foil the Nazi plans and turn the tide of war. Auroch Digital recently gave players a tantalising sneak peak of gameplay in a 10 minute commentary video. Design Director Tomas Rawlings walked players through the opening mission of the game, detailing the mechanics, gameplay and background lore. Tomas showed Mademoiselle Dubois and Corporal Singh making their way behind enemy lines, moving through a deadly forest crawling with Nazi enemies, in order to rendez-vous with thee rest of Charlie Company - Captain Harris and Sergeant Carter.